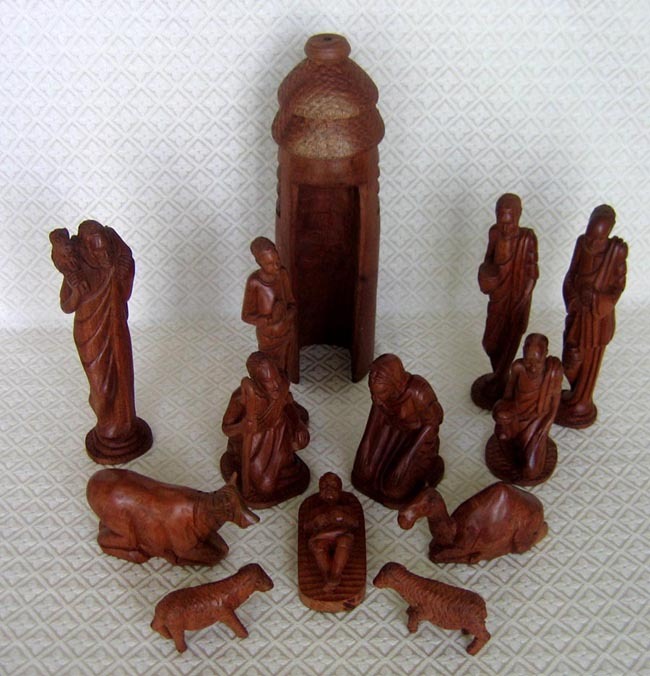 This Nativity set was carved from mahogany wood by artisan George Obeng near Accra, Ghana. George has been commissioned to do works in wood and stone for the Ghanaian government, as well as other national governments. The set features 13 figures: the Holy Family, a hut with carved thatched roof, an angel, a shepherd with a lamb around his shoulders, two sheep, a cow, a camel, and three wise men with gifts. The male angel is an interesting figure because he is carved simply with no wings and has his hands in a praying position. The hut measures 12.75 inches tall, while the shepherd and standing wise men measure 9 inches tall. Support of orphaned Liberian refugee children.